We are currently seeking corporate sponsors to join our Premier Sponsor Lorraine Thomas and our prominent presenting sponsors JM Family Enterprises/SE Toyota Distributors and Ultimate Software for our annual spring luncheon where over 500 corporate executives and community members gather to celebrate outstanding community advocates, honor a domestic violence survivor, and support Women In Distress. 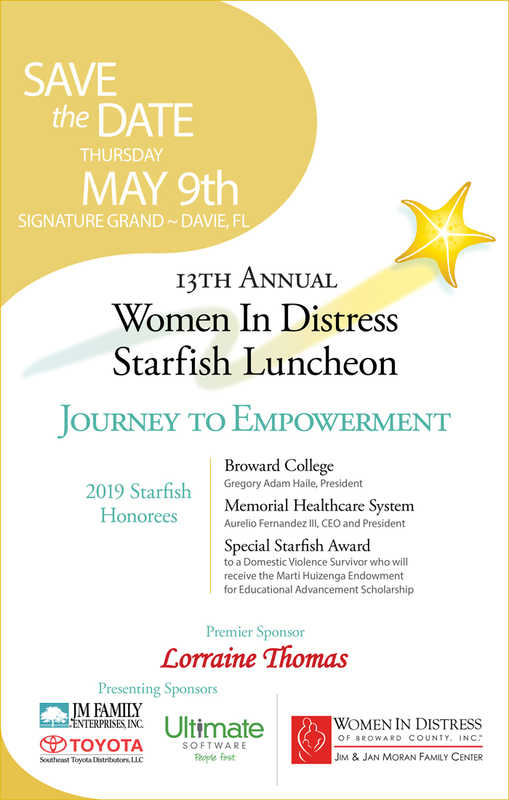 Our 2019 honorees include Broward College, President Gregory Adam Haile; Memorial Healthcare System, CEO & President Aurelio Fernandez, III; and a Domestic Violence Survivor who will receive a Special Starfish Award and the Marti Huizenga Endowment for Educational Advancement Scholarship. You can learn more about the Starfish Luncheon here.